You are at:Home»Liquor»Whiskey»Does Whiskey Evaporate? Can it be Stopped? 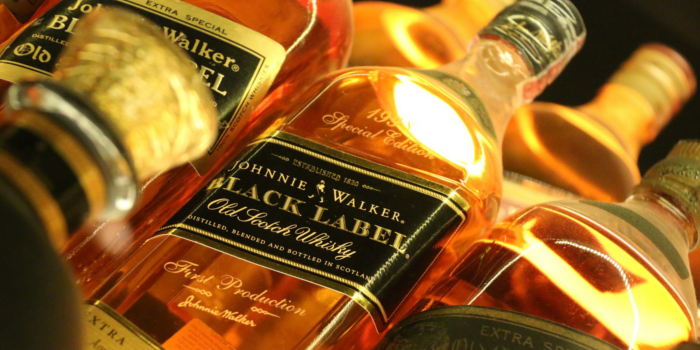 Bottles of Johnnie Walker black label old scotch whisky | Will the whiskey evaporate while in the sealed bottle? As decanter specialists, one of the most common questions our customers ask us is, “Does whiskey evaporate?” The answer isn’t a clear yes or no since several factors are involved. Whether or not it evaporates depends largely on how it’s stored. Once the bottle has been opened, the liquid is, of course, exposed to oxygen. If that exposure continues, a slow process of evaporation begins. Have you ever seen a vintage bottle of whiskey with a noticeably lower fill line than usual? If so, you’ve seen firsthand the effects of evaporation. This gradual process has been charmingly coined the “angels share” since the liquid mysteriously disappears as if to the heavens. Thankfully, you don’t have to share your whiskey if you don’t want to. When stored properly, it can have an infinite shelf life—even after the bottle has been opened. It all comes down to climate, the level of humidity, and the proper sealing of the open bottle or decanter. Whiskey doesn’t take well to warmer, drier climates. We hate to break it to you but if you’re storing your whiskey in a warm environment, you will see a little more disappear each year. That’s what we call slow torture! To avoid it, always store whiskey in a cool, dry place away from direct sunlight. Too, make sure it’s kept in an airtight container. And when we say airtight, we really mean it. Beware since some containers that seem to be tightly sealed may only be fooling you. For example, glass decanters and bottles with plastic corks might seem like a good choice. However, glass contracts and expands depending on the temperature. Plastic does not. So as the glass changes, your plastic cork will be the weak link that allows air to seep in and damage your whiskey. Additionally, you’ll want to avoid decanters and bottles with cork seals, which can do more harm than good. Because cork is an organic material, it has the potential to dry out over time or even deteriorate—both of which could damage the whiskey. Now you know what to avoid, but what should you use instead? Based on the types of containers you shouldn’t use, can you guess what you should store your whiskey in? Hands down, the best choice is a premium glass decanter with an airtight seal. That’s a sure way to end that occasional deluge of “does my whiskey evaporate” line of bewilderment for good. Our premium whiskey decanters feature a truly airtight ground glass seal. With a seal like this that lasts a lifetime, it’s impossible for oxygen to get in. There’s no better way to preserve every drop of your whiskey or to maintain the quality of it. You Don’t Have to Watch Your Whiskey Evaporate! Many believe the only benefit of a whiskey decanter is the pleasing appearance. While there’s no denying the splendor of a decanter filled with this golden liquid, a glass decanter with an airtight glass seal is actually the key to avoiding whiskey evaporation. The suave and sophisticated look is just an added bonus! Now a question for our whiskey lovers. What have you found to be the best place for whiskey storage?